In the bottom of the 1st inning in Pittsburgh on Sunday afternoon, Bryce Harper checked his swing with two strikes. There was an appeal to third base umpire John Hirschbeck who claimed that Harper went through with the swing, and called him out. Bryce Harper was not happy with the call believing that he did check his swing. 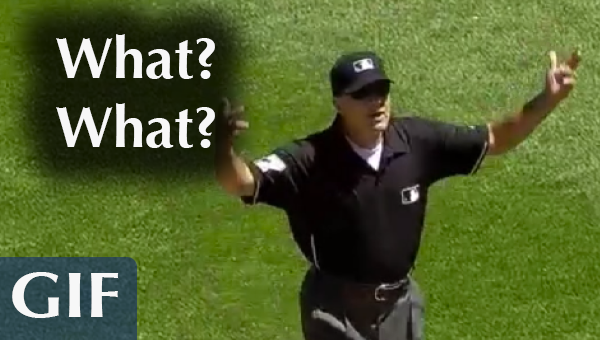 The replay showed that the pitch should have been called a strike, but it wasn't and Harper acted out. Bryce threw his hands up in the air to which Hirschbeck took exception. Hirschbeck threw his own arms in the air and walked towards home plate and Bryce Harper. He stopped on the way to tell Nats 3rd base coach Trent Jewett to get Bryce back to the dugout, as Bryce remained in the batters box looking down the third base line. Haper started to walk back to the dugout but tossed his helmet behind him at home plate and that was all remaining needed for Hirschbeck to eject Harper from the game. Here's sort of how it went down, in GIF form.